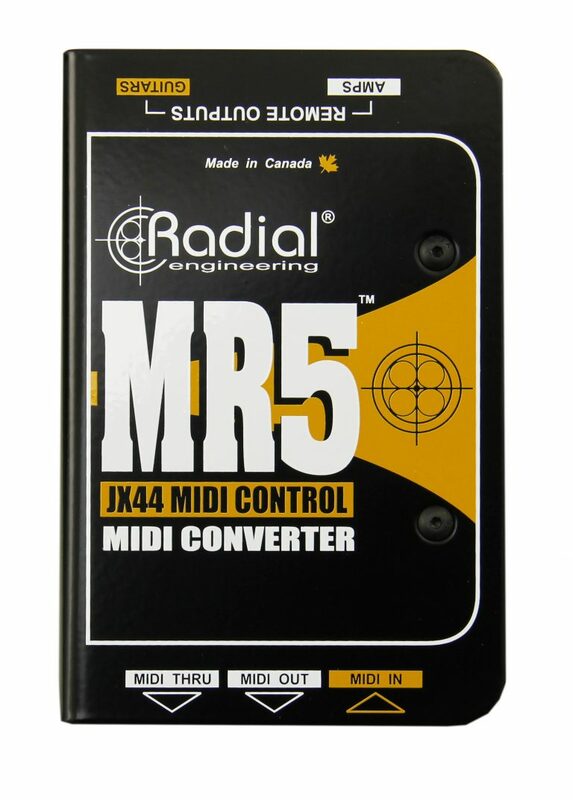 The Radial MR5 is a MIDI signal translator that allows you to use a MIDI controller to drive the JX44, JX42 and other Radial products that use the JR5 footswitch. 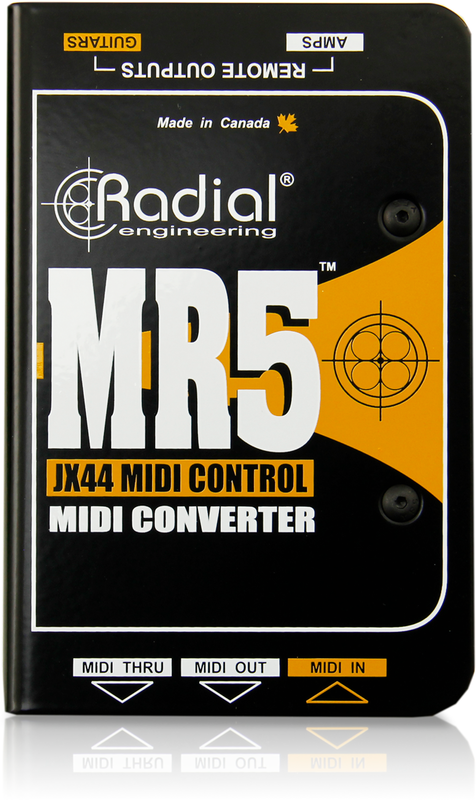 Equipped with MIDI in, out and thru jacks, the MR5 converts the MIDI data stream from the controller to a data format used by the JR5. This is then sent to the receiving Radial device via XLR jacks to remotely control active inputs, outputs or other remotely accessible functions. The MR5 can be configured to any one of the standard 16 MIDI channels or used in Omni mode to respond to all MIDI channels at the same time. Instrument switching on the JX44 or JX42 can be controlled by MIDI control changes while the amplifier switching on the JX44 can be controlled via MIDI control changes, MIDI program changes or both simultaneously. The MR5 can be used in conjunction with the JR5 so the musician can still enjoy stage remote controllability while the MR5 receives control messages from a sequencer, control pedal or a MIDI track from background orchestration software. Using the MR5 is easy to integrate into any MIDI setup. A side access 8-position dip-switch enables the user to configure the MIDI setup as needed while a side access reset switch allows for instant setup recovery. Standard XLR cables connect the MR5 to the JR5 inputs on various Radial products, while MIDI equipment connects using standard 5-pin DIN connectors. Because the host Radial product automatically powers the MR5, no external power supply is required. 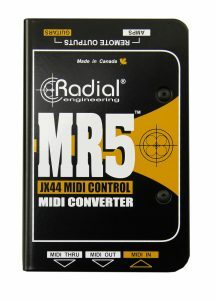 The Radial MR5… an easy way to add MIDI to your Radial switcher setup!